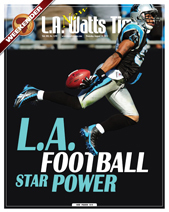 Although the city of Los Angeles has been without a National Football League team since the Raiders followed the Rams right out of town in 1995, L.A. born players will be most prominent and dominant this season in both the NFL and collegiate ranks. More players born in Los Angeles will wear NFL uniforms than any other city, with an estimated 114 on rosters opening day. On the college circuit the top team in the nation is bowl eligible USC. While you are channel surfing throughout this football season, you are likely to see some of these local African American players shine in the colors of their team. If the Raiders never turn their fortunes around he will not be the single reason, but when the late Al Davis allowed for this pure cover corner to leave via free agency you knew the old man had lost it. Although he was born in Louisiana, he is Nigerian. He attended Bishop Montgomery, Leuzinger and Narbonne before signing with Cal Berkeley. His 15 career picks is not close to describing how valuable a player he is which is why the Eagles paid $60 mil to get him. If he does his thing Philly can live up to expectations. If you want to know why Oregon didn’t even flinch when their most productive offensive players from 2011 bolted to the pros, you need to look no further than the return of this senior power runner who hails from Lynwood. He rushed for 123 carries on just 15 carries against USC last season while averaging 8 yards per carry. 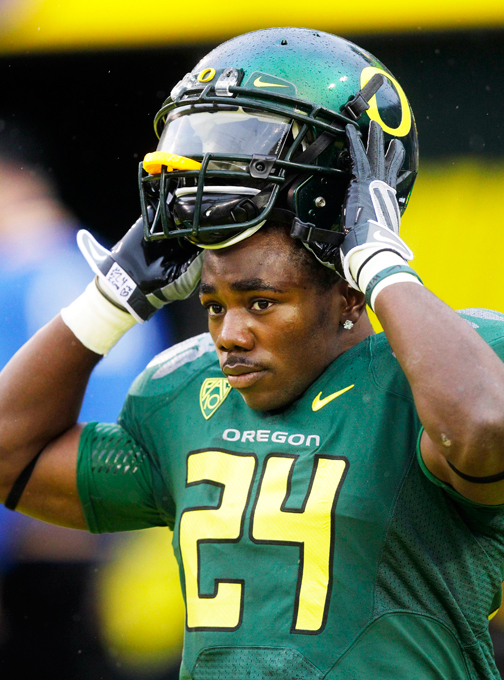 Here is why Oregon will scare the scarlet and gold out of USC. Born in Pasadena. His dad, Richard Bell, was a wing back at Nebraska and was drafted by the Pittsburgh Steelers in the 1990 NFL draft, where he played for one season as a running back. He is also related to former Major League Baseball star Darryl Strawberry who won four World Series titles with the New York Mets and New York Yankees and was an eight-time All-Star during his 17-year career. Young Jared is a defensive back for the Buffs and planning to make his own headlines this season. Bet you probably didn’t know the success of the ‘Dream Team’ would probably be riding on the trusted shoulders of an unheralded corner back from Inglewood who prepped at St Bernard. Hanson didn’t even make the team in high school as a junior, but helped the Vikings excel as a senior. Despite not being recruited by the big boys, he went to El Camino College, was an undrafted rookie to make an impression with the 49ers before being cut and now has a two-year deal with the Eagles. Hard work pays off. Donald Penn played at Utah St. and Jose Hanson played at Texas Tech and El Camino Community College. Matt Barkley could have been the second pick in the 2012 NFL draft, but decided to remain a Trojan probably because there are not better receivers in the NFL than he has on his team. One of them is this elite high flyer that caught 73 passes for 1143 yards and 11 touchdowns, as a FRESHMAN! He also ran for another 285 on returns and another score. This super sensational sophomore from Serra High School in Gardena already has NFL scouts drooling and agents lining up at his doorstep. A three-sport star at Serra where he was exceptional in football, basketball and world class in track is off the charts and reason for the Trojan horse to get in shape for this campaign. DJ has always been a bonafide star from the moment he took flight playing for local powerhouse Long Beach Poly where he led the Jackrabbits to the CIF Southern Section title as a senior in 2004. He was an MVP in the Army Under Armour All American game the same year he got away to Cal, a mistake USC and UCLA never quite recovered from. Even after starring at Cal and giving SC and the Bruins nightmares he lasted until the second round where he was nabbed by the Eagles and has been their go to wide out ever since. He took last season off from the field, dismayed that he wasn’t rewarded with a sizeable contract that he subsequently got this year. Born and raised in Los Angeles he has caught passes for more than 4,000 yards and scored 21 touchdowns during a brief three-year career. The sky is the limit for him and he knows it and with the cash in the bag, he has no more excuses to point at. A two-time Pro Bowler already he could be aimed towards Canton when its all said and done. Here is another St. Bernard Viking that went undrafted, but is currently starting offensive line in the NFL. Further proof that if you are good enough the NFL will find you. He went to Utah State before the Minnesota Vikings signed him, made the Pro Bowl in 2010 and is now the primary protector of quarterback Josh Freeman. Only one of 35 NFL players to achieve more than 10, 000 receiving yards with 59 touchdowns and six TD returns on kickoffs for the only team he has ever played for during an illustrious 11 year NFL career. 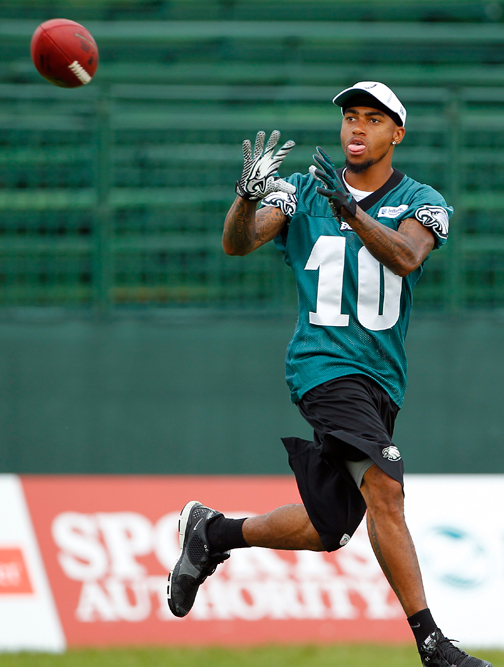 A Los Angeles native who attended University High before going to Santa Monica College and earning a scholarship to the University of Utah, he is everything that DeSean Jackson wants to be. Durable and a fiery competitor who is a five time Pro Bowl selection. Undoubtedly the most accomplished football player on this list. Cam Newton threw to him 29 times for 1,394 yards and six touchdowns in ’11 and there is no reason not to expect more from the duo this season. When Snoop Dogg gives you a nickname then you must be really something! The Black Mamba electrified crowds while at Crenshaw where he played three positions, running back defensive back and wide receiver in addition to returning kicks. Not to mention that he ran a blistering 20-second 200 meters for the Cougars track team. He could have been the reason the USC football program never recovered from probation if not for Lee and Woods, but Oregon is sure as heck happy he decided to come there. As a true freshman for Oregon he amassed a staggering 2,235 all-purpose yards, while his season haul of 18 touchdowns reset the school record for number of touchdowns by a true freshman. He turned in a stellar two touchdown, 314 all-purpose yard performances in the Rose Bowl that helped propel Oregon to a 45-38 victory over Wisconsin. 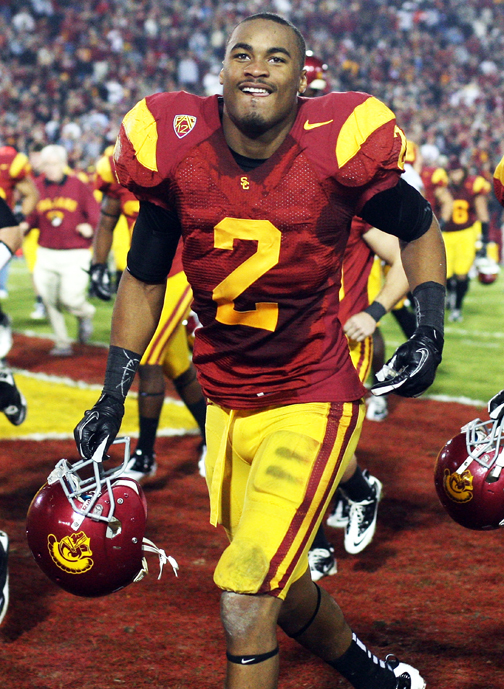 In that game, his 91-yard touchdown run broke the previous Rose Bowl record for the longest run from scrimmage. His only other carry in that game resulted in a 64-yard score, giving him a 77.5-yard average for the mention. The Heisman trophy is next! Another Los Angeles native flying under the radar in the Bay. A sixth round draft pick by the Niners in 2006, he played high school ball at Pomona High, went to Mr. San Antonio College and then Central Missouri. A tightend with a wide receivers speed, which makes for him a difficult cover in the West Coast offense. A name to be reckoned with on the upstart 49ers. The other tandem in that dynamic duo at USC that just would not allow for Barkley to leave for the riches of the NFL. Born in Gardena where he also attended Serra High School where he starred in football and played basketball. A year ahead of Lee and will probably leave with his quarterback to the NFL following what should be a banner season. Has 176 catches for more than 2,000 yards receiving in career at SC. This rugged albeit versatile linebacker who played on the same high school team with DeAnthony Thompson is a NFL prototype who runs well from sideline to side line and is a big play threat. He played on the offensive backfield and on defense for Robert Garrett at Crenshaw and had 12 solo tackles against Oregon in 2011. Undoubtedly a major defensive anchor for the No. 1 ranked Trojans whose future is well beyond the collegiate ranks. 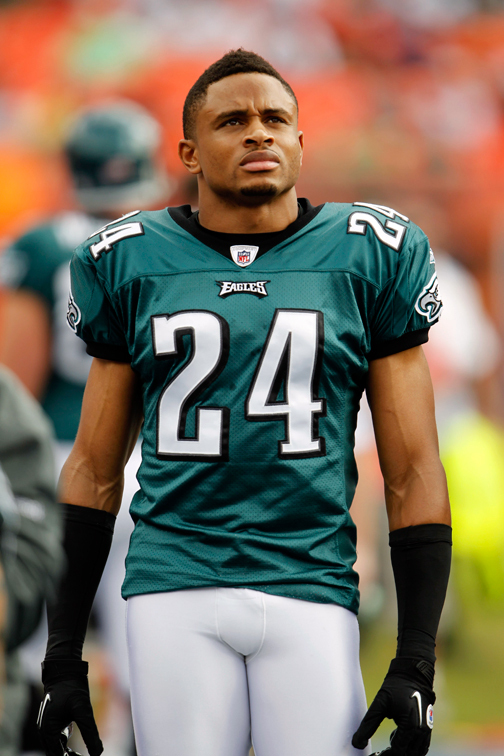 Born and raised in Inglewood, he is just additional proof that with or without an NFL team, we got pros playing here!